Setting up business anywhere requires dedication, grit and industry know-how, and choosing the right location to base a start-up can be a major factor in helping a new company to get off the ground. As one of the UK’s leading science and innovation campuses, Sci-Tech Daresbury is home to a thriving community of international high-tech businesses to fast-growing SMEs and has a burgeoning reputation as offering a ‘home for life’. Among them, one start-up is enjoying significant growth at the Liverpool City Region-based campus and has now significantly expanded its workspace in order to continue to meet increasing demand for its ground-breaking technology and innovation. Microbiological contract testing provider, Perfectus Biomed has expanded the company’s operations at the campus’s new Techspace One building. Perfectus Biomed’s evolution at Sci-Tech Daresbury has been partly accelerated by the campus’s world-class technical facilities and scientific expertise – creating a unique space for start-up and early stage companies to mature. Sam Westgate, Perfectus Biomed’s founder and CEO, believes the campus’s interconnected location has helped to boost her company’s growth. She said: “As an international provider, it’s very important to us that we have the facilities and connectivity to engage regularly in face-to-face meetings with our clients. The company has expanded its workspace at the campus and now boasts 1,237 sq ft of lab space and 1,394 sq ft of office space. 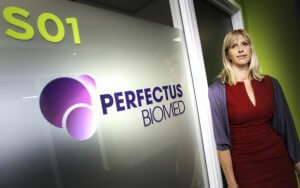 Having first located to Sci-Tech Daresbury in 2013, Perfectus Biomed supports companies by providing both standard and customised microbiology testing methods. It works with clients in the wound care, cosmetics, dental and disinfectant sectors. John Downes, group managing director of Langtree and chair of the Sci-Tech Daresbury joint venture company, said: “Our vision for Sci-Tech Daresbury is not only one of collaboration, but also of business growth, success and creating an innovative environment where our tenants can find a home for life. Perfectus Biomed has been with us from the start of its Sci-Tech Daresbury journey, and evidently has found a collaborative and inspiring home to work.